All around are happy people, pink people, spotty dresses, and an ambience. An inexplicable ambience, of people with nothing to do but enjoy themselves. What was striking this year about Málaga feria is that it is nothing more than that, yet that in itself is more than enough. 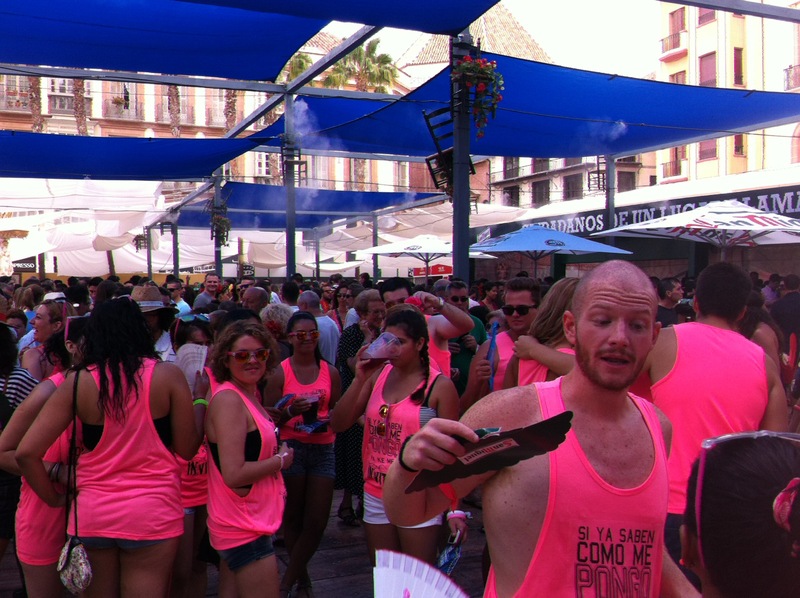 In the city from some unspecific time before lunch, until exactly 7pm, it is feria. And everybody is taking part. Everybody knows what to do. You wander the streets, join a crowd watching some spontaneous flamenco dancing or a group of singers, you wander on, you sit awhile outside a bar watching happy people, pink people, wandering by. You pick at some tapas, and you wander on. You buy hair decorations from a street vendor. You thrown coins in a hat for a man on stilts, or for a trio of music students. Of course there are lots of bars in the Plaza de la Constitución, and more pop-up bars in alleyways, plazas, and otherwise disused buildings. And some Portaloos in a side-street. The Ayuntamiento has organised the infrastructure. But there is little organised activity. Perhaps in la Plaza de los Flores there is a rota for the bands – it seems that people knew when the Free Soul Band was on (the plaza was packed for them). Or maybe there isn’t a rota. 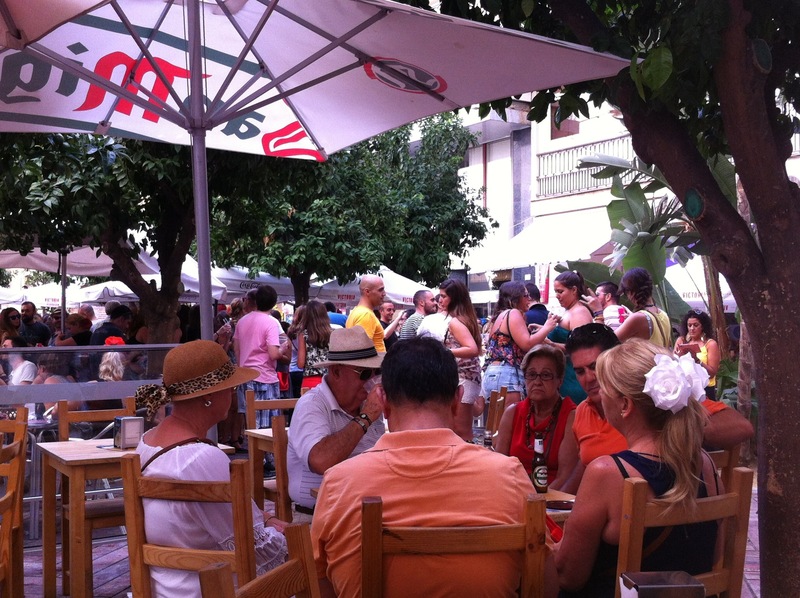 Málaga feria has a delightful feel of just happening. Numerous groups of youngsters have made “uniforms”. Matching t-shirts, or matching hair-decorations. Not to perform, just to be noticed and perhaps to find each other in the crowds. Groups of ladies have rehearsed, and find a space to dance flamenco. The city is on holiday and everyone is in the centre taking part, even though “taking part” simply means being there. We meet a friend, stop for coffee, meet another, move on for something to eat. Nothing fixed, nothing planned. We drop in at a caseta we’d enjoyed the year before, dance a little, take photos of strangers who take photos of us. 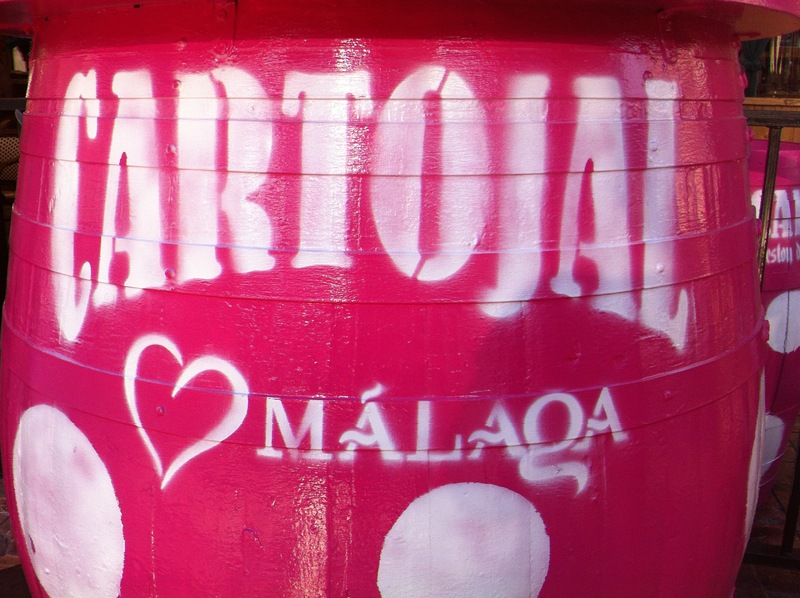 And everywhere, pink barrels, pink banners, pink Cartojal bottles of Málaga wine. Pink dresses, pink children, pink everything. This is feria. Malagueños do not need a programme of events, a running order, a plan. All they need is to be told “This is your week, this is your feria.” The ayuntamiento enables the feria, but the people are the feria. And as though the oxygen is turned off, suddenly at 6.30pm the street-cleaners emerge to sweep up the countless bottles and to water down the paved streets, now sticky with spilt beer and wine. The musicians pack up, and the beer pumps are turned off. The crowds disperse, many to catch the buses out to the recinta for the night feria, where they will continue to dance, eat and drink until 5am. Many simply wander home, and others head off to a favourite restaurant. 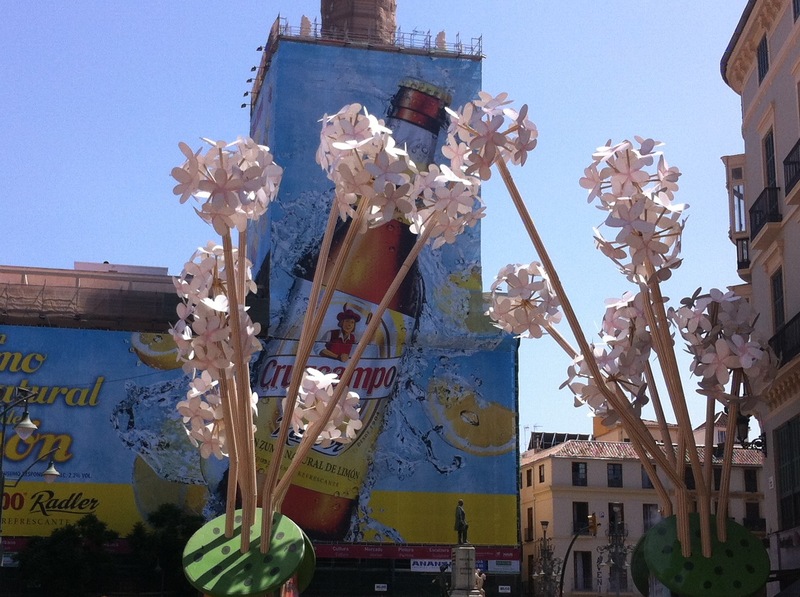 It’s still Málaga, it’s still a holiday, but it’s not the feria any more. That moves now to the fairground out towards the airport (see last year’s article). But here, in the centre, it is quiet, it is over until tomorrow. 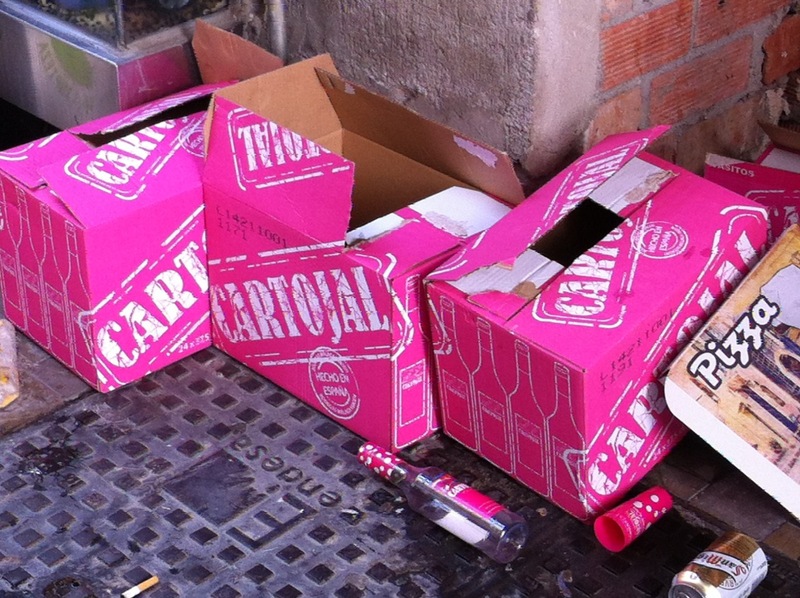 The police watch the last of the bands load their van, and the bars stack the empty pink wine-boxes more or less neatly for collection. The clean-up continues, the pink people drift off, and over the cathedral the sky turns pink, joining the colour scheme of feria. 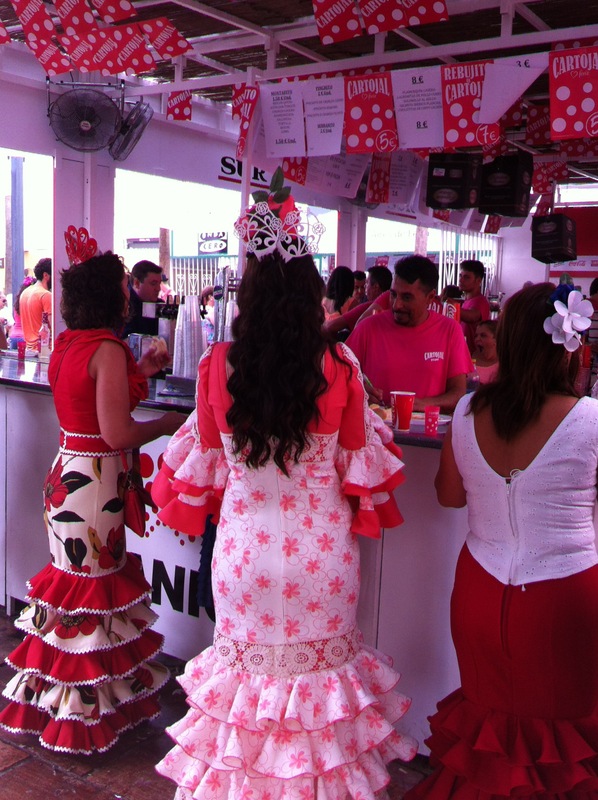 This entry was posted in Spain and tagged Andalucia, feria, flamenco, Málaga, pink, Spain by tamaraessex. Bookmark the permalink. Wish I had gone now – you made it come alive! You sum it all up beautifully – as always! However, you also describe one of the things I find most frustrating when trying to enjoy / participate in local fiestas. It’s knowing what is happening and when! Not to mention why! After 8 years I still feel like the onlooker I am, slightly bewildered and convinced I am missing the best bits! Friends I have made locally struggle to answer my enquiries, because to them it just “is” what it is. I think some things you just need to be born into. The most I can hope for is to enjoy from the sidelines, and go home bewildered!